Unsettled Landscapes looks at the urgencies, political conditions and historical narratives that inform the work of contemporary artists across the Americas – from Nunavut to Tierra del Fuego. Through three themes – landscape, territory, and trade – this exhibition expresses the interconnections among representations of the land, movement across the land, and economies and resources derived from the land. (b. 1961 in Tijuana, Mexico, lives in Tijuana, b. 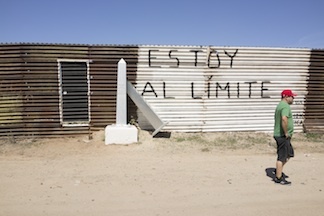 1965 in Beaufort, South Carolina, U.S.A.; lives in Tucson, AZ) DeLIMITations is conceived as a survey of the 1821 border between Mexico and the western territories of the U.S. 1821 marks Mexico’s independence from Spain, when the nation defined its borders as a sovereign entity. 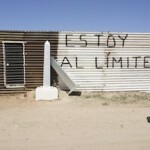 The border with the U.S. would be redrawn following the 1848 Treaty of Guadalupe Hidalgo, in which the land that currently makes up the states of California, New Mexico, and Arizona was ceded to the U.S. at the end of the Mexican–American War (1846–48). During July and August 2014, the artists will travel approximately 2,300 miles along this historic boundary, occasionally marking it with faux monuments that resemble the 1892–95 obelisks. The journey provides the conceptual structure for the artists’ engagement with the landscapes and communities they encounter. Through social media, performance, sculpture, photography, and site-specific interventions they will explore issues of local and national identity as shaped by geography.Follow ERRE’s and Taylor’s cross-country trip along the historic 1821 border between the United States and America, on Google Earth and view their updates from the road via their twitter and tumblr feeds accessible in SITE’s galleries and via the Unsettled Landscapes website at unsettledlandscapes.org.They will be making stops at Brookings, OR; New Pine Creek, CA; Denio, NV; McDermitt, NV; Jackpot, NV; Medicine Bow, WY; Leadville, CO; Cañon City, CO; Pueblo, CO; La Junta, CO; Syracuse, KS; Garden City, KS; Dodge City, KS; Texarkana, TX; Orange, TX; and Port Arthur, TX among others. A survey of the 1821 border between Mexico and the United States.